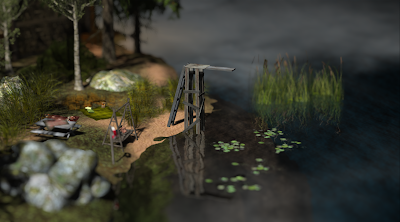 For those of us who have never been to Finland (that would include your writer), the sim Finlandia promises to give us a little glimpse. 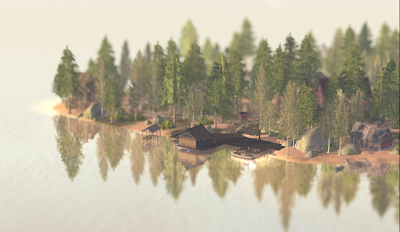 "See a piece of Finnish nature," the sim's description says encouragingly. Designed and owned by Daniela Finchy, it's a picturesque place, a heavily wooded island with a variety of scenes that I found tempting for photos. Right now the aurora borealis shimmers overhead, and you can grab a bike and speed around the island, visiting a windmill, a swamp, a moonshine still (which is of course where I'm sitting as I write this), a smoke sauna, various farm structures, a treehouse and other spots. I'm always encouraging people to help support lovely public sims, and this one is no exception: tip jar at the landing point. Oh, and do look at the world map to see the shape of the region. If you know your geography it should remind you of something!